Thank you very much for visiting our page. We are an English Parish Church in South Oxfordshire. The earliest surviving parts of the church date from about 1200. Its lead font may be slightly earlier and there may well have been a chapel in Warborough since 1140. In 1539 the living was acquired, and is still held, by Corpus Christi College, Oxford. 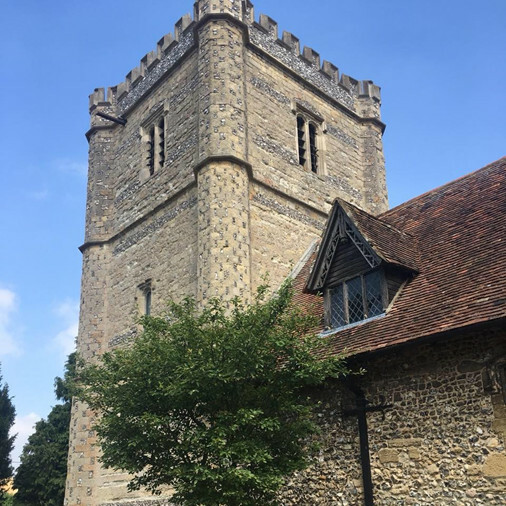 As part of the Dorchester Team Ministry since 1977, we share a vicar with our neighbouring villages of Chiselhampton, Newington and Stadhampton. We try to embrace the ideals of a rural parish church. We hope to make all people welcome whether you are worshipping with us for the first time or have been coming for years. We are here for those who come to church regularly as well as those who do not. Our worship is traditional Anglican with a small robed choir at our main service at 11.00 each Sunday morning. A team of bell ringers ring regularly before this service. If you live within the Parish boundary you have the right to a baptism or a wedding at the church and the vicar is available to take a family funeral in the church or at a crematorium. 5th Sunday We have a Team Service at a church within the Dorchester Team Area, usually at 10.30am. Unless the Team Service is at Warborough or Stadhampton, there is always a service of Holy Communion at Warborough, at either 8am or 6pm (see local notice boards). In addition, there is a Service of Morning Prayer in church every Monday, Tuesday, Wednesday, Thursday and Friday starting at 8.15am and lasting about 25minutes. The vicar is always delighted to hear from you if you would like to discuss any of these services. We look forward to working with you to make your service personal and meaningful.